Q: Can You Use Wax Strips On Your Face? Q: Is It A Good Idea To Wax Your Face? Q: Are Veet Wax Strips Safe For The Face? Q: Can I Wash My Face After Waxing? Q: Does Waxing Facial Hair Make It Grow Back Thicker? Q: Can I Use Wax Strips To Groom My Eyebrows? I find mustache (or some stubble) hot in men and whiskers are so adorable in pets but on my face? Nope. Thanks to my dad’s genes, I was born half Yeti, half human – also known as Humaneti (jk!). Anyways, I have slightly darker peach fuzz, a bit of a mustache, maybe a sprinkling of unibrow…gosh, in other words, I’m hairy (nothing to be ashamed of!). Facial hair removal is a big thing for me. I’m always on the lookout for the next best thing in terms of hair removal products and today, we will be focusing on the best facial wax strips out there. I’m sure a lot of you have been searching for the best facial wax strips reviews because you’re interested in trying strip waxes or maybe wanted to know how it fares compared to regular waxes and shaving. I got your back girls! This article will review the top 3 best facial hair removal strips in my book: GiGi, Nad’s and Veet, as well as important things related to this procedure (hint: it’s not for everyone). Want to go all natural? 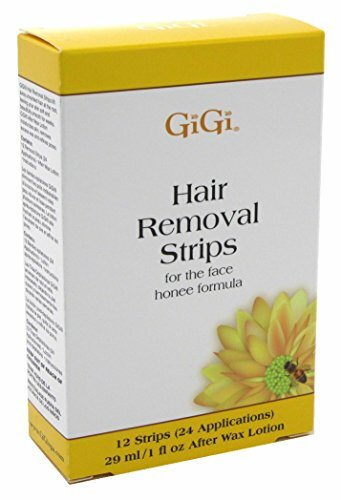 GiGi hair removal strips are definitely one of the best facial hair wax strips on the market, loved by both men and women! Each wax strip is carefully smeared with a milder formulation of their famous Body Honee, perfect to use on sensitive areas such as your face, underarms and bikini line. The strips are slim enough to use on every nook and cranny of your face, no more cutting or trimming required, just mess-free precision each and every time. Made with GiGi All Purpose Honee, it’s guaranteed to be all-natural and safe for sensitive skin and delicate areas. Strips are slim enough to be used on the upper lip, eyebrow, chin, and hairline for more precise hair removal. It does the job but does not remove hair in one go. Hair has to be a certain length for it to be effectively removed. 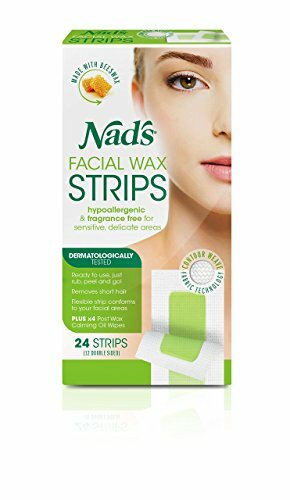 If you’re a sensitive Bella, Nad’s is the best facial wax strips for you! Made without any artificial colors or fragrance, their wax strips are guaranteed hypoallergenic and safe for sensitive skin. Its softer and flexible strips conform to your facial curves for a more seamless application and removal making the whole waxing experience nearly pain-free. Dermatologically tested hypoallergenic and fragrance-free (perfect for sensitive skin and delicate areas!). Softer and more flexible strips that fit your facial contours for effective hair removal. Works well on fine to coarse facial hair. Contains beeswax which is a known allergen for some people. One of the big players in the world of hair removal, Veet offers yet another effective hair removal product. These facial cold wax strips calm the senses with its Velvet Rose scent while the strip itself caresses the skin with skin nourishing and calming essential oils. Taking the strip off is a breeze thanks to its patented Easy GripTM tab. Veet makes waxing an ahh-mazing spa-like experience! Contains essentials oils to calm the skin and a relaxing Velvet Rose scent. Strips feature an Easy GripTM tab that makes strip removal effortless. The wipes are indeed effective in cleaning off the residue and calming the skin. May contain chemicals that some people may be allergic to (such as perfume). Waxing is indeed a great way to remove facial hair since it is convenient and super effective. No lengthy preparations required unlike using soft or hard wax where you still need to heat up the wax, wait till it cools down to a tolerable temperature before you apply, wait again till it’s ready to be ripped off. It’s just full of waiting, you guys! We ain’t got time for that! With wax strips, you just warm it up a bit by rubbing it in between your hands, apply it on the area, rub it towards the direction of hair growth and peel it the opposite direction. Voila! Smooth face in an instant! Since the strips are preloaded with wax, all you need to do is to just slap it on the area that you wish to groom. No more getting tangled in a web of wax or having to clean up any sticky/hardened spillage. If you’re new to waxing or got unstable hands (like me), wax strips are your best bet, since most facial wax strips are slim enough to be used on certain areas of your face (such as that area in between your brows, upper lip, etc.). You can be assured of precise hair removal unlike using soft or hard waxes where it can accidentally get smeared on areas where you’re not planning to remove hair and shaving where you can’t undo the damage (like accidentally shaving half of your brows). Since we’re removing hair directly from the root, waxing either via soft, hard or strip wax can offer a week’s worth (or more) of smooth and hair free skin. That means, better makeup application and skin care product absorption. These two are very synonymous to shaving, it’s good that you won’t get any of that with waxing. If you’re part of the population predisposed to getting stubbles or ingrown hair (due to genetics/coarse hair), do not lose faith. There are products out there that could help minimize skin irritations caused by hair removal. One of them is Tend Skin. For more info on this amazing product read here. As you keep removing hair that’s been growing on the same hair follicle, it eventually weakens it and soon it dies or gets damaged. A dead/damaged hair follicle won’t be able to produce hair so you’ll notice unwanted hair getting thinner and lesser over a certain period of time (depending on how often you wax). I highly recommend strip waxing for people who can tolerate a bit of pain and want a quick and effective hair removal method, with results that last longer than shaving. If you’re taking birth control (or any hormone replacement medication), blood thinners, antibiotics, and acne meds such as Accutane. If you have cancer or are undergoing cancer treatment (chemotherapy or radiation). If you’re currently using exfoliants on your skin (like retinol, AHAs, Salicylic Acid, Hydroquinone, etc.). Waxing should be avoided by these people due to the fact that certain conditions, drugs, and skin care products (such as those mentioned above) can make our skin sensitive and more susceptible to redness, irritation and bruising. Always consult your doctor before trying out any hair removal method. Getting the best results depends on the right waxing technique. While experience is still the best teacher, knowing a few tips and tricks can help save you from pain and irritation and bump you up to pro-waxer level! Keep in mind the following tips before, after and during your waxing session. Make Sure Your Face is Clean – You won’t be able to wash/wet your face after waxing so make sure that you wash it before you even wax. Thoroughly remove any makeup by double cleansing. Skip Your Cuppa Joe – Drinking coffee and other stimulants can make your skin extra sensitive. Wait a couple of hours after drinking coffee before you start waxing. Got Tanned Lately? – Whether it’s via direct sun exposure or a tanning bed, you should wait at least a day or two before hair removal. This is to give your skin some time to heal in case it got severely burned. Remove Any Accessories – Like your septum ring if you’re doing your upper lip, or your eyebrow ring, etc. We don’t want them to accidentally get caught in the wax strip and pull your flesh along with it (I’m cringing). Pull Your Hair Back – We only want to remove unwanted facial hair and not the hair on our head. Put that hair up on a bun, use a headband to draw any hair away from the face/treatment area. Open Up Your Pores with a Warm, Moist Towel – Open pores can help remove hair easily (with less resistance) therefore minimizing the pain. Can’t Handle The Pain? – You may apply a numbing cream (e.g., with Lidocaine) at least 30-45 minutes prior to waxing to remove pain. Rub-a-Dub-Dub – Rub that strip wax to warm it up so that it can adhere to the hair more efficiently. I see girls complaining that their wax is not effective, it doesn’t get any hair. Girl, that is because you ain’t warming it enough. You got two hands, rub it really good! Rub The Strip in The Direction of Hair Growth – This helps embed the unwanted hair in the wax much better so that it all comes off in one pass. Hold The Skin Taut – This is where most newbies fail. If you don’t hold your skin taut while you strip the wax off, you’re putting yourself at risk of peeling part of your skin away or getting a nasty bruise. It may also increase the pain from waxing as well as cause redness in the area. Pull It Off in The Opposite Direction of Hair Growth – This helps in effectively removing hair without breakage. Got Leftovers? – I know most of us are perfectionists when it comes to hair removal, we want the area to be 100% har free, but wait! Don’t pass on the same area twice! Your skin is still sensitive from the blood flow in that area (from ripping the strip off). If there are a few leftover hairs, tweeze them instead. Soothe Your Skin – Your skin just went through hell, now is the time to give it the TLC it deserves. Cold compress and aloe gel can help calm the skin and alleviate any redness. Avoid Sun Exposure – As your skin is still sensitive, it can react negatively to extreme heat or sun exposure. If you can’t avoid it, at least wear a hat and some sunscreen. Avoid Perfumed Skin Care or Makeup Products – Skin is still sensitive and may react differently to your regular beauty products. Do Not Wet The Skin – Wait at least 24 hours before wetting/washing your face. Activities such as swimming should also be avoided after waxing. A: Absolutely! Using wax strips is an effective and nearly painless way to remove facial hair. If you’re a first-time waxer, I suggest waxing less delicate areas first (such as your legs), just to get accustomed to the pain and the whole waxing process. As you build your tolerance and your technique, you can then move on to sensitive areas such as your face, underarms and bikini line. A: It all depends on your preference. If your facial hair is not noticeable at all, I suggest just leaving it alone, but if you find it bothersome and attention-grabbing (especially for those with PCOS and Hirsutism), then facial hair removal may be a good idea. Personally, I do facial hair removal for the benefits I’m getting out of it more than the aesthetics. I find that my makeup application is more seamless without teeny tiny hairs (peach fuzz) getting on its way, plus, my skin absorbs my facial products better. If you’re sensitive to pain or if you bruise easily, I suggest trying dermaplaning using a Tinkle razor instead of waxing. A: If we’re talking about the regular Veet strips for the body, no, I don’t recommend using that on the face. Veet has a variant specifically made for facial hair, and the size and formulation of this are perfect for people with normal skin. When used correctly, Veet Facial Cold Wax Strips offer safe and effective facial hair removal. If you have sensitive skin, make sure to do a patch test prior to using the strips on your face as it may contain chemicals (such as fragrance) that may trigger an allergic reaction to some people. Check out the Veet face wax strips review above for more details. A: Nope. It is recommended to veer away from wetting the waxed area for at least 24 hours after waxing. A: As we’re pulling hair from the root, waxing does not alter the thickness of your unwanted hair. In fact, repeatedly waxing the area can weaken the root overtime making hair grow finer. A: For removing unibrows (or that excess hair in between both brows), wax strips should be fine. 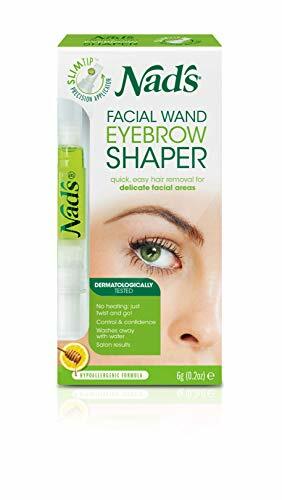 However, if we’re talking about actually removing stray hairs around the eyebrows or shaping them, then we’d need something more precise like the Nad’s Facial Wand Eyebrow Shaper. It’s got the same hypoallergenic formula but in a precise pen form perfect on dispensing the right amount of product where you need it the most. Get on-fleek eyebrows for weeks! Strip waxing is a great way to remove unwanted facial hair. I would highly recommend it to people with excessive hair growth such as those with Hirsutism caused by PCOS, my co-humanities (born naturally hairy), or anyone who wants to keep their face smooth and hair free for a longer period of time. Contraindications are above, do check it out for your safety! When paired with the right waxing techniques, using the best facial wax strips can ensure waxing success. Have you tried any of the products above? Share your experience with us! Let me know which other hair removal product you’d want me to try and feature in my blog. Cheers to my beautiful humans out there! Till the next article!